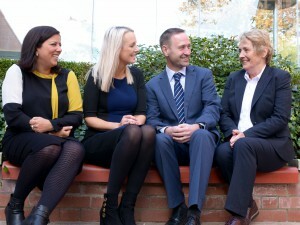 Pictured at the launch of the new Diabetes Network for NI are (l-r) Sophie Lusby, Health and Social Care Board; Anne Beattie, Service User; David Chaney, Diabetes UK NI National Director and Dr Brid Farrell, Public Health Agency. A Diabetes Network for Northern Ireland has been established to bring together people living with diabetes, their carers and health and social care professionals to work in partnership on the design and delivery of better diabetes services. Over 88,000 people in the north of Ireland are living with diabetes and this rises annually by more than 3,000 due to our ageing and growing population. It is estimated around 12,000 are also people living with Type 2 diabetes and have not yet been diagnosed. Type 1 diabetes is where the body has a total lack of insulin (this is not preventable). In Type 2 diabetes, the body produces too little insulin or cannot use it effectively. This is linked to obesity, ageing and family history. Ninety percent of cases are Type 2 diabetes, which is largely preventable. 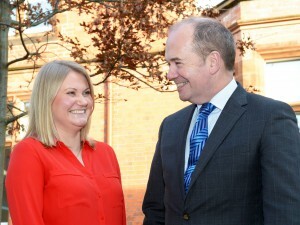 The Diabetes Network has been set up following the recent launch of the new Strategic Framework for Diabetes by the Health Minister earlier this month which is part of a series initiatives to support ‘Health and Well-being 2026, Delivering Together’ which aims to transform Health and Social Care (HSC) services across the north. The Network will be led by the Health and Social Care Board (HSCB) in partnership with the Public Health Agency and Diabetes UK Northern Ireland. “The vision of the network is to lead the improvement of care for all people living with all types of diabetes and those at risk of developing diabetes in Northern Ireland. Most importantly the Network has been set up on the principle of partnership between all stakeholders especially people living with diabetes and our primary care colleagues. Today’s event launched a series of regional work programmes to focus on the priorities laid out in the Strategic Framework, such as improving access to foot care, diabetes patient education and making the best use of new technologies. Diabetes Locality Groups will be established across Northern Ireland as part of the Network over the coming months. The groups will be led by clinicians and people living with diabetes and tasked with driving through improvements in their local areas such as new care pathways and procedures. Diabetes UK Northern Ireland National Director, Dr David Chaney, commented: “Diabetes UK Northern Ireland anticipates that the work of the Diabetes Network is outcome-driven in order to plan, provide and importantly, implement changes, for the health care of 100,000 people living with diabetes. We are optimistic that service users will be given a voice throughout the process in order to highlight the issues that matter the most and identify the gaps in service that require action. “Diabetes is a manageable condition so it is imperative that for those living with the condition, as well as those providing the care, are supported by the Health Service in a way that means real change can take place resulting in better outcomes for those living with diabetes, he said. The event was attended by over 100 people across the region, many of whom are living with diabetes, as well as health and social care professionals from HSC Trusts, Public Health Agency, Department of Health, HSCB and representatives from the community and voluntary sector.